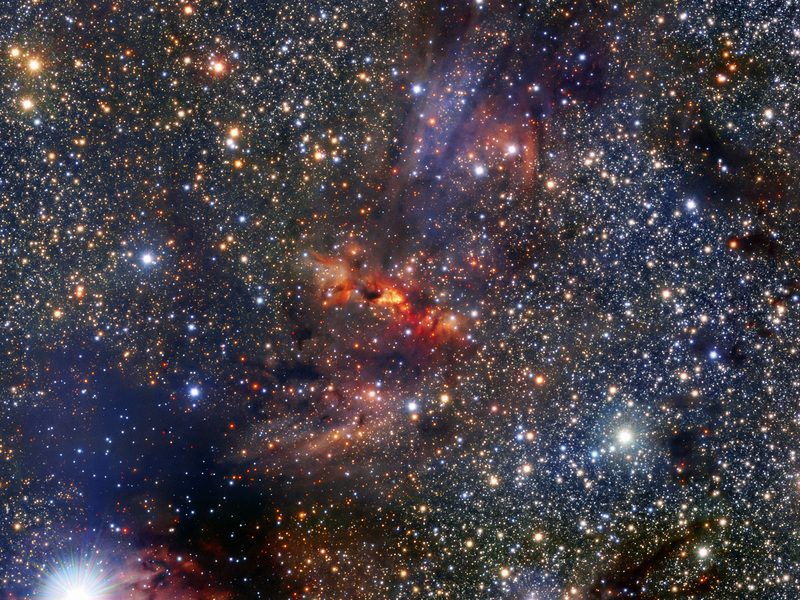 This image shows a region of the Milky Way that lies within the constellation of Scorpius, close to the central plane of the galaxy. 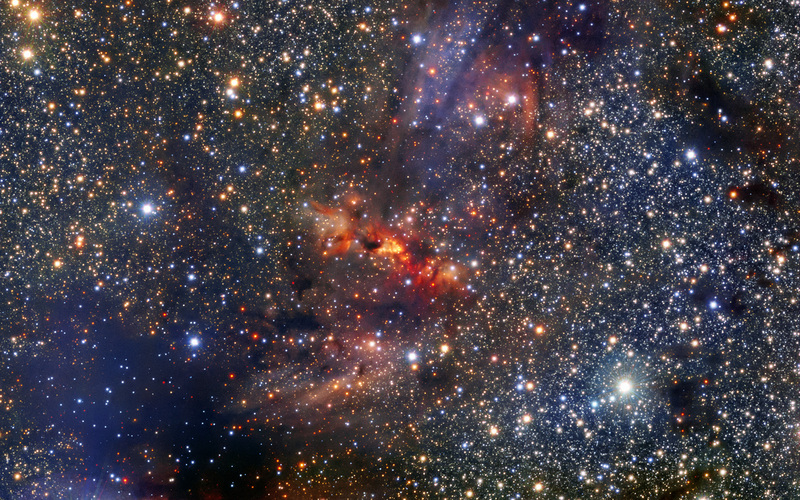 The region hosts a dense cloud of dust and gas associated with the molecular cloudIRAS 16562-3959, clearly visible as an orange smudge among the rich pool of stars at the centre of the image. Clouds like these are breeding grounds for new stars. In the centre of this cloud the bright object known as G345.4938+01.4677 can just be seen beyond the veil of gas and dust. This is a very young star in the process of forming as the cloud collapses under gravity. The young star is very bright and heavy — roughly 15 times more massive than the Sun — and featured in a recent Atacama Large Millimeter/submillimeter Array (ALMA) result. The team of astronomers made surprising discoveries within G345.4938+01.4677 — there is a large disc of gas and dust around the forming star as well as a stream of material flowing out from it. Theories predict that neither such a stream, nor the disc itself, are likely to exist around stars like G345.4938+01.4677 because the strong radiation from such massive new stars is thought to push material away. 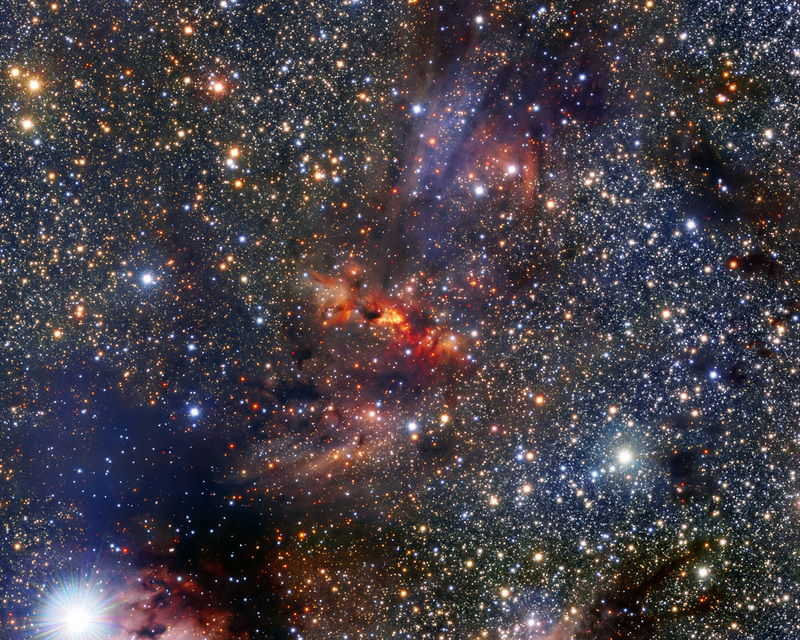 This image was made using the Visible and Infrared Survey Telescope for Astronomy (VISTA), which is part of ESO’s Paranal Observatory in the Atacama Desert of Chile. It is the world’s largest survey telescope, with a main mirror that measures over four metres across. The colour image was produced by the VVV survey, which is one of six large public surveys that are devoted to mapping the southern sky. 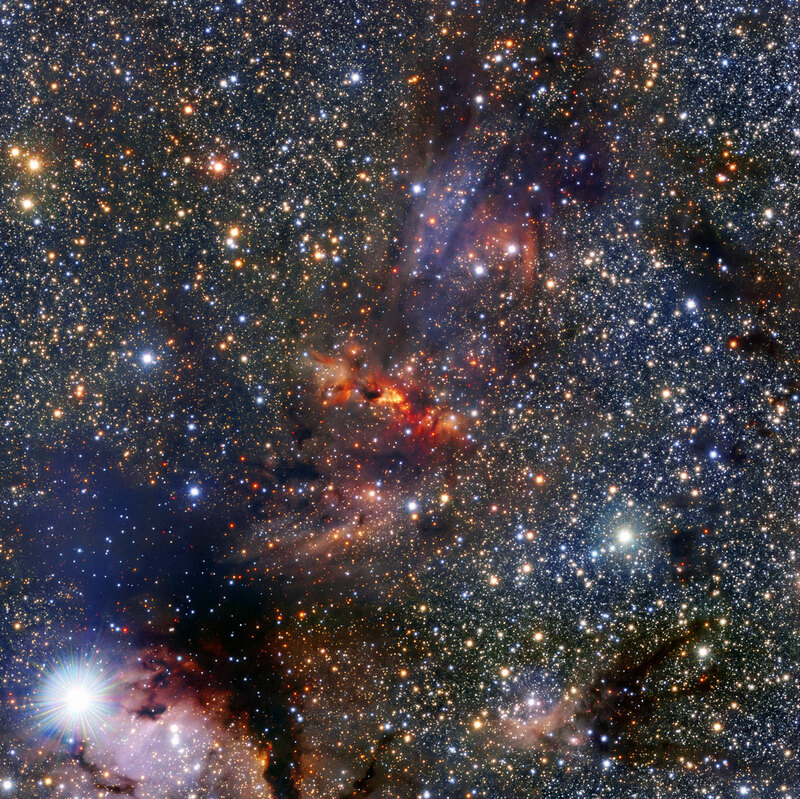 The bright star in the bottom left of the image is known as HD 153220. Position (Dec): -40° 3' 42.70"